It’s only August and Sony has managed to now surprise us with two cameras that seemed to have come out of nowhere. The FS700 brought super slow motion to a new, more affordable level and the EA50 looks to bring interchangeable, large sensor ENG style cameras to a new price level as well. But where does the EA50 fit in? I’ll be honest, it took me a little while to wrap my mind around it. The camera seems to have ergonomics figured out very well, down to the slide out shoulder pad. This is a camera that was made with ENG shooters in mind…except for the lack of built in ND filters…but we’ll get to that. So what is the EA50? The EA50 is a cross between a consumer camera and a pro camera. It uses a similar (or same) sensor to the NEX 5N; a 16.1MP APS-C E-mount stills sensor with the ability to shoot video. It is a world cam and offers similar framerate options to the FS100; up to 60p at full 1080. It shoots to AVCHD on SD cards with support for the 128GB FMU. It has XLR inputs for pro audio as well as manual controls all over the body of the camera. It is not an ENG FS100. Sorry to disappoint. As stated before, the camera is basically a rehoused 5N or VG20 and does not use the same sensor as the FS100 or FS700 or F3. The premium that you are paying for is the ENG style body, LCD screen with loupe, XLR inputs, manual controls, etc. That premium is estimated to be $4500 which is a lot more than a $600 5N. So who is this camera perfect for? ENG, event, wedding and perhaps documentary shooters. The price with lens is over $1000 less than a FS100. But the key is that the EA50 is ready for shoulder use right out of the box. If you wanted to rig the FS100 in an ENG fashion, it would require hundreds more dollars of equipment and you would end up with a larger and heavier camera. The only thing that prevents it from being the perfect ENG camera is the noticeable lack of ND filters. Sony said that they omitted ND filters from the FS100 due to the flange depth. However, with the FS700 they managed to remedy this problem. I don’t know whether they wanted to prevent competition with the FS700 or if they were afraid it would bring the price up too much, but a lack of ND filters may be a deal breaker for many. Filmmakers may want to avoid the EA50 simply because it lacks the Super 35mm sensor of the FS100. If you’re looking to upgrade from a DSLR, the EA50 doesn’t look to be an improvement in image, but rather an improvement in body, design, inputs and functionality. Sony managed to announce two new and exciting products alongside the EA50. The first is a RAID based memory stick. In what may be the first of its kind, Sony’s new memory sticks have a built in backup. For example, a 64GB card has two 32GB mirrors in it, so if one side gets corrupted, the other side is still secure. Instant backup with a single memory card; pretty cool! The one that I’m more excited about is the new power zoom lens. 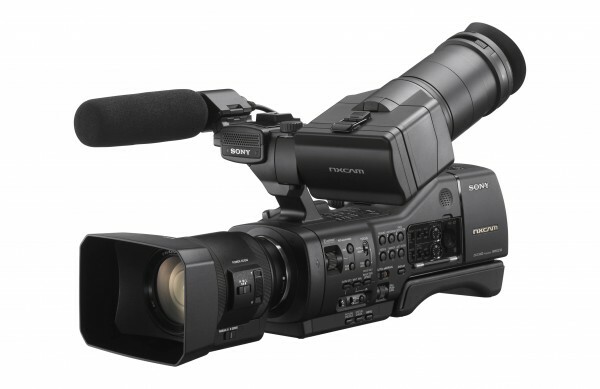 When the FS700 was shown at NAB, we all asked Sony what the zoom rocker on the side could be used with but they were very hush-hush. We knew that Sony released a zoom PL lens for the F3…but that was $10,000! Currently no zoom E-mount lenses were available so we knew Sony had something up their sleeve. With the announcement of the EA50, their new SEL18200PZ18-200 (just rolls of the tongue) was revealed. It features the same optics as the kit lens for the FS100 and FS700 but includes a servo zoom which can work with the zoom rocker on the FS700 or lanc controls with your FS100. No word on pricing for the lens alone, but it should be available separately before the end of the year. If the EA50 is the perfect camera for you, you can get your pre-order in right now with an expected ship date of October 15th. Leaving out the ND filter issue (I really don’t know what the heck is Sony’s problem with ND filters) — I’m thinking this is Sony’s late response to the AF-100. Do we actually know for a fact that it’s the NEX5 sensor? Or is that an assumption on the part of a writer of this article? From the pictures it’s certainly a handsome camera — as handsome as the AF100 is ugly. But, obviously, that’s irrelevant if the image stinks. We know it is a 16.1MP sensor. Since the FS100 and FS700 have sensors specifically designed for HD and 4K respectively, we know that it isn’t the same sensor. And since the 5N and VG20 both have still sensors that are used for video, we can assume that the EA50 is in the same series. The biggest thing that means is a higher potential for aliasing and moire and probably not the same sensitivity as the FS100/FS700. I don’t think we can make that assumption (unless you’ve got a broad definition of “series,” like made on the same continent). And, I’ll bet you one dollar Sony will dispute your assumption. This is exactly like when people assumed the AF100 had the GH1 sensor. Turned out they were wrong. The AF100 has a smaller sensor. The other issue is this new “lossless zoom” that’s being reported. Does the NEX5 do that? First of all, the AF100 was announced with different specs on the sensor than the GH2 right off the bat. No one assumed it was the same one cause the pixel count was different. The EA50 has the exact same specs as the 5N. Second of all, since it is a 16.1MP sensor, the odds of it producing zero aliasing or moire is highly unlikely. Also the odds of it being the same or similar sensor to the FS100/FS700/F3 is pretty much zero. Camera is great for it’s functionality. It got every thing and a filmic look added by SDOF. No ND is a BIG mistake that Sony does because of the NS100. The problem with Sony is that they launch so many products that they become in top of others, so they can´t put too much in one, otherwise it will kill the other.